This is taken from the project I'm currently working on. 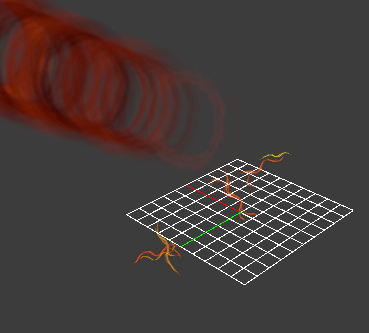 The basic idea behind this particle system was that this projectile is a cyclone/tornado in xy-axis travel forward with certain amount of velocity. If you don't have any basic in particle editor, please go to this link first. Before you read further, here is the finished product. Don't worry too much about the statue model, I put it there just to check height reference before porting into the map itself. There are many ways to approach this but here is how I approach it. 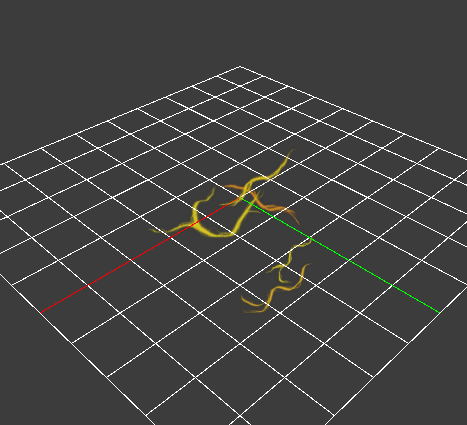 Now let's start making this particle system. Open particle editor and create new Particle. Add "Render sprites" in Renderer. Add "Emit continuously" in Emitter. Add "Lifespan Decay" in Operator. Add "Sequence random" in Initializer. 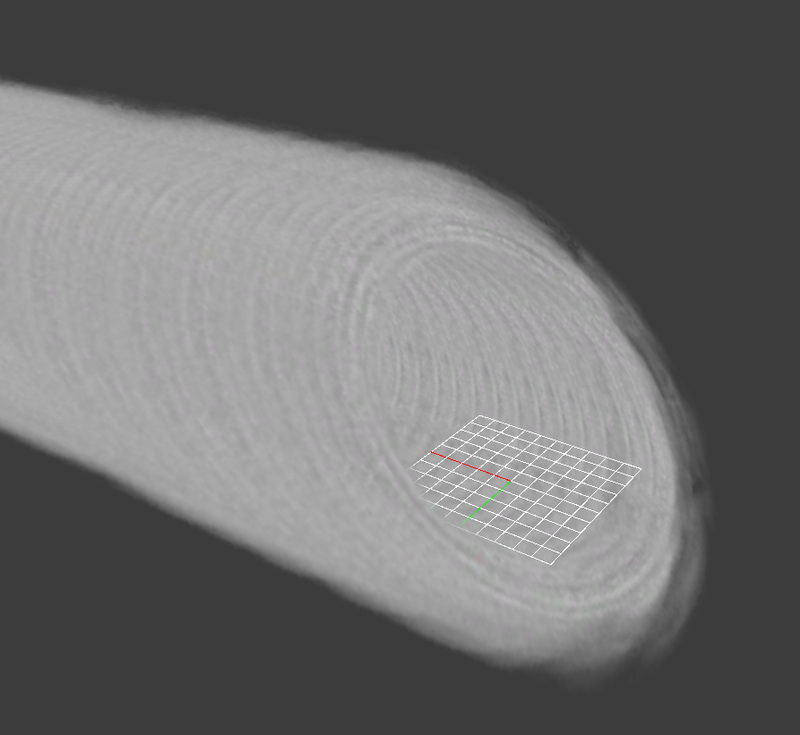 Now it's time to place this particle somewhere. Add "Position within sphere random" in Initializer. We don't need to change anything here since it's just reference point for emitter. Now your particle should look like this. Well it shouldn't keep lying on the floor like that. Now we want to rotate it to the direction that it should face. But before we get to that, we have to set up something first. Add "Movement basic" in Initializer. I will leave these two functions as default since I don't need anything special about velocity in this system. Now if we adjust the Control Point #1 on the right hand side, you can freely adjust the velocity as if it is a control point in-game, so you can see result immediately. 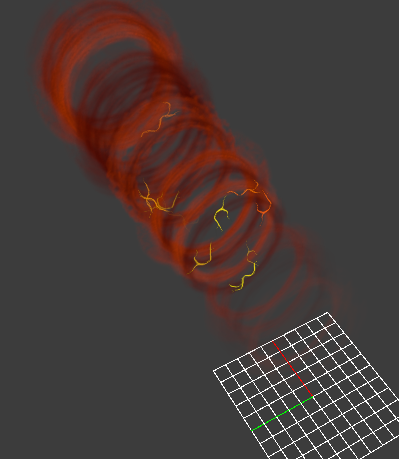 My particle now moves but it faces upward, and I don't want that. Let's rotate our particle with following functions. Add "Rotation orient to 2d direction" in Operator. Add "Rotation from CP forward orientation" in Operator. 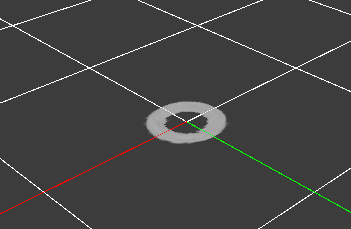 These two functions will automatically adjust your sprite so it faces the direction it's moving all the time. I chose not to use 90.0 in second function because at 90 degree, your particle will be very hard to see from the top, so I adjust them down a bit. Now you should see result like this. Now basic functionality is done, I will adjust the outlook of the particle by following function. Add "Color random" in Initializer. Add "Position modify offset random" in Initializer. This is so that our particles will start in the air instead of on the ground. You can pull reference model up to adjust the height as you like. Add "Remap control point to scalar" in Initializer. And adjust the value to the following. Now put these values into the control points on right. Now those are all the initializers you need, let's now adjust the detail while our particles are traveling in operator. Since I feel like the tornado should grow larger as it goes and there should be fade in and out effect, I add the following functions to the system. Since it is kinda power wave, I want to add the feeling of being unstable to the system. So I add these functions. Add "Ramp scalar linear simple" in Operator. Add "Noise vector" in Operator. What I said about "done" is actually a lie. You still need to adjust your particle count. My advice is that keep the count at minimum to suit the purpose of your system. Currently, the particle count should be at around 300 all the time and it's not good for overall performance. 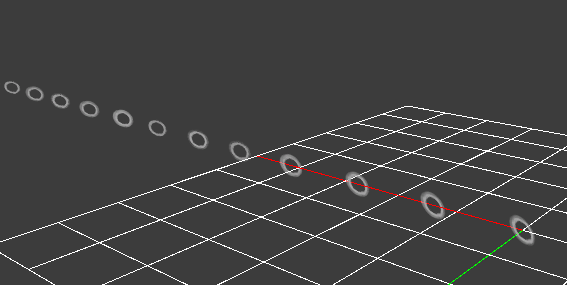 Since my particles will be used somewhat as a projectile, I don't want high particle counts. To reduce this I change the following setting. With this, the particle count should be below 60 at all time since I want them to emit only for 2 seconds, 30 particles each, and the memory allocated is only enough for 60 particles. 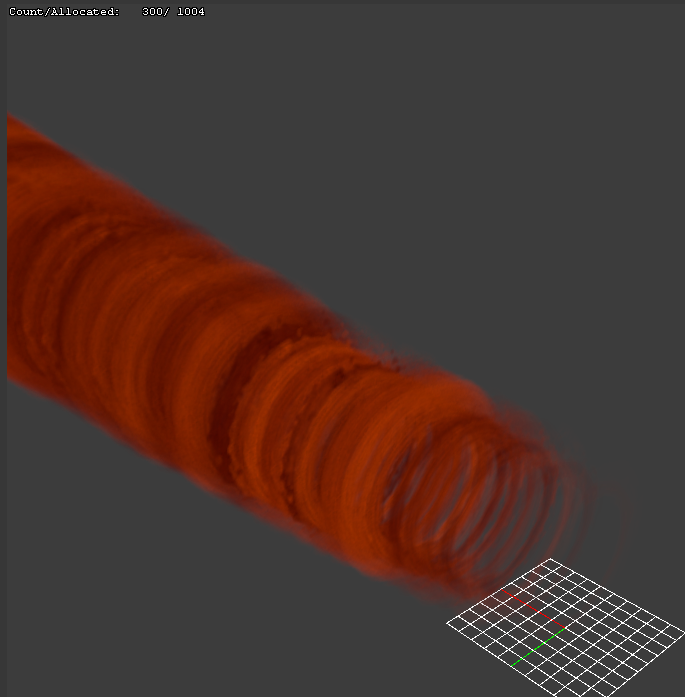 Now your base wave particles are done. Very important, don't forget to save. 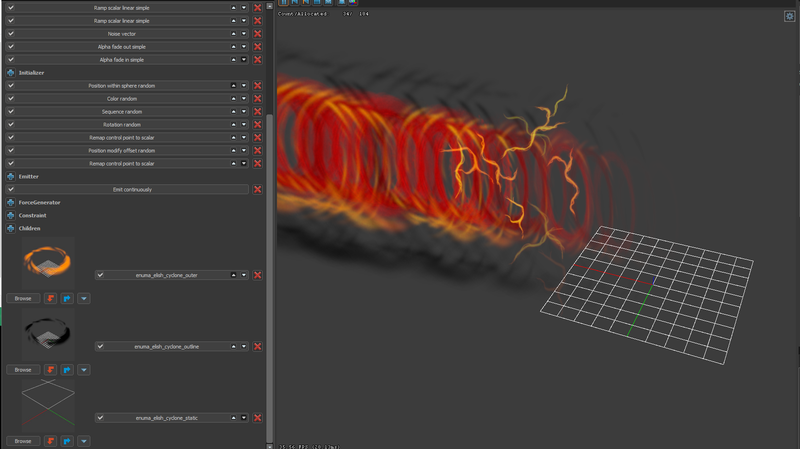 Now that I have my wave particle working, I feel like it needs something like an electric spark during the duration. However, since this particle is based on the wave particle, we need to make some adjustments to the wave particle. Create new particle for static and save it. In wave particle, add newly created particle as a children. First off as usual, you want to start rendering your sprite and emitter and decay. Now think about the actual electric spark, it needs to be fast, colorful, looks different all the time, and a little bit of transparency. From those idea, I add following functions. Adjust the color accordingly for Color random, and leave Rotation random as default. For other functions, change the value to following. Now you should have something similar to this. When that's done, we want to change our radius accordingly as we already had control point in wave particles and make the spark scatter from the center. As you can see, now our particles are huge! 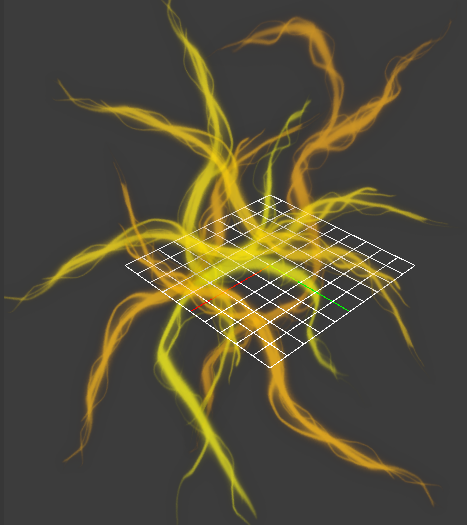 Sparks are supposed to be small so let's resize it with this, add a little bit more movement to our sparks, and also add some fade decay to our particle. Add "Movement basic" in Operator. Add "Alpha fade and decay" in Operator. Adjust the values to the following. Now your spark should look something like this. 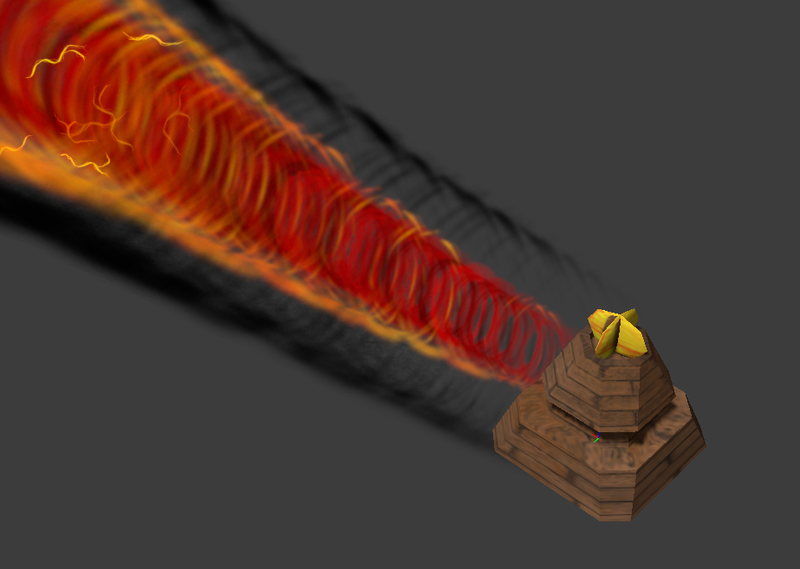 With the wave particles, it looks like this. Now we want the spark to follow the wave, we add this function to the spark particle. Add "Position from parent particles" in Initializer. Leave the value as default, you can adjust it to your taste though. Now we are almost done, we have to reduce particle count in the system. Change the values of the following function. Now that's done, you should see something like the following in your wave particle. With this, your spark particle is done. Feel free to adjust the value to your taste. You may wonder why I list this part as optional. It is not a requirement since it doesn't really make you see what's happening in the particle editor. When you head into the game, if the place has light color background, it will become very hard to see bright color particle. With this ground particle, I basically layout the dark particle under the wave particle to make it more visible to the user. This particle borrows most of the value from wave particle except one function. I will list all of the functions and its adjusted value below. For more detail on each of the functions, please go back to read in wave particle section. Don't forget to save your file. Now that's done, let's combine all the works together. Our system is almost finished. Now we are going to add multiple layer of wave. Save as a new particle for an outer layer (this should have no children). 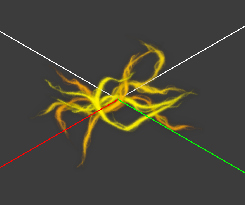 Save as a new particle again for the outline (this should also have no children). These three layer will behave the same, there are only three different between each layer. Let's set our 3 layers (or more if you want to) as following. For the inner most layer, our core layer, adjust the color to become very bright, have radius end scale in Radius scale as 0.6, and sequence min/max set to 7 and 8. For the outer layer, second layer, adjust the color to be between the very bright color and black, have radius end scale in Radius scale as 1.0, and sequence min/max set to 7 and 8. For the outline layer, last layer, adjust the color to be black and have radius end scale in Radius scale as 1.2. Now we combine the two outer layer into our core layer by adding children. Your screen should look like this. Add ground particle as children. Add wave particle as children. It is important that ground particle is above wave particle. This is the order in which your particle will be rendered. If ground particle is below wave particle, it will be on top of wave particle and that's not how we want it. In the ability you want to use, put these lines in. With those implemented, your particles should show up in-game now. 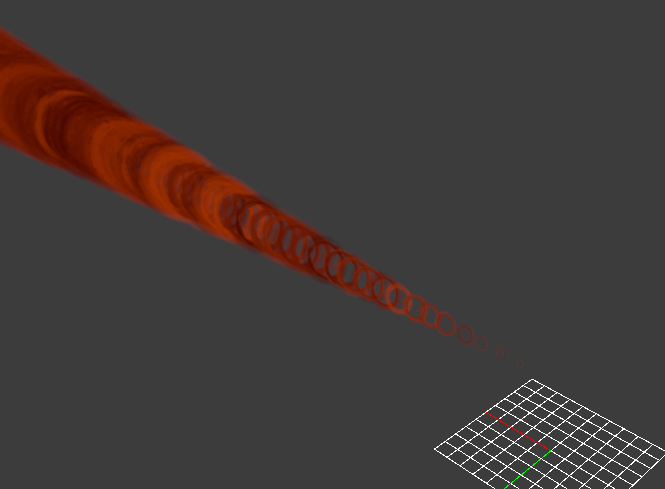 This concludes my tutorial on making Chaos Wave particles. 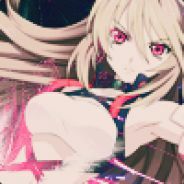 If you have any comment, question, or improvement to the guide, please do not hesitate to leave a comment or contact me. Let me know what you want to see created next!